Looking Back......The day I Met Watchmaker George Daniels — RGM Watch Co. I first heard of George Daniels back in the 1980’s when I first went to school for clockmaking and watchmaking, I quickly went on the hunt for his now famous book on watchmaking, back in the 80’s the first edition was available, and I bought a copy. I spent many hours, months, even years reading and examining the illustrations in the book. I dreamed of making his tourbillon watch which he outlines over several chapters, who knows maybe some day I will make that watch. The book was also my first introduction to Engine-Turning which has a chapter devoted to it as Mr. Daniels would Engine-Turn his own cases, and dials. I was instantly fascinated with this work also, and as many know I pursued it some years later hunting down machines and finding craftsman to help teach me this beautiful craft. Today we make many beautiful watches with this handmade work. Once I started RGM in the early 1990’s I would attend the Basel Fair each year meeting suppliers and other people in the watch industry. Every year I would make this trip to Switzerland and would also take the time to visit other companies not at Basel. This was very important then when I was just starting out making and designing my own watches, I rarely attend the fair now. If you have ever been to the Basel Fair you know how large this event is, and back in the 1990’s it had even more companies there as it was also a big show for suppliers. Now the fair has changed a lot over the years, and it’s very different today compared to then. One year in the mid 1990’s when I visited the Basel Fair, I made my way back to the stand of the Académie Horlogère des Créateurs Indépendants (AHCI) and to my surprise George Daniels had a watch or two on display, I also heard he was there at the fair, but at the time I was in the stand he was not there. I stopped back a few more times but I missed him each time, I thought I would not see him at all during the visit. I was tired from the trip and thought I would go back to Neuchatel where I was staying early that day, so I made my way to the train station in the middle of the afternoon. After making my way to the platform I could see the train was there waiting, once I boarded it looked like a ghost train, not many people were leaving Basel at that time. I made my way into one of the cars and there was only one person in the car, to my amazement there he was the master himself, George Daniels sitting there by himself. I couldn’t pass this opportunity up, so I went and sat across from him and introduced myself. 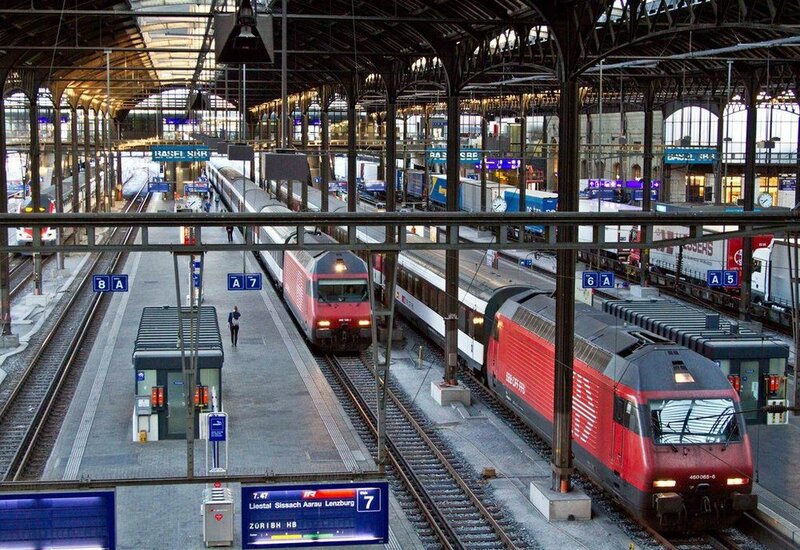 The train station in Basel is pretty big with several tracks, I was surprised when we left the station that know one else was in our train car. I was going to Neuchatel which is a fairly long train ride from Basel, and Mr. Daniels was going to visit his good friend and watchmaker Derek Pratt who was another legend in watchmaking. During this train ride of course we talked about watchmaking, the watch industry, and many other things. He was wearing two wrist watches, one was a Rolex and the other was an Omega, both watches were fitted with his Daniels Co-Axial escapement which he had done years before. He expressed to me his disappointment in the Swiss watch industries lack of interest in his escapement. He told me about some of his meetings and it seemed at that point he had given up hope of ever seeing it produced on a large scale. Of course, we all know a few years later Omega decided to work with him, and the Co-Axial escapement is being used across the Omega lineup today. I remember being at the Basel Fair the year it was introduced and seeing Mr. Daniels, and Mr. Hayek talking about it for the press and attendees in the Omega stand. We continued our conversation on the train, and I was talking about Tourbillon watches, he quickly let me know that he thought the tourbillon should be seen from the back of the watch, and not from the front. At that time Breguet and some other brands had the Tourbillon featured on the front of the watch which is what most customers of these watches wanted. Mr. Daniels was old school and that’s what I would expect from the old master. We continued the conversation and he handed me his Rolex and Omega to look at. He said that the timing of the watches with his escapement was better then the rate he could achieve with the original escapements. I am sure he spent many hours fitting and adjusting the escapement to these watches. We talked for almost and hour and half on this amazing horological train ride, what a privilege I will never forget. Once I found my way back to my hotel, I thought to myself, you could never arrange a private conversation with George Daniels for an hour and half. Somehow I think I was meant to leave the Basel Fair early that day.